“This world we live in I find hard, I find everything hard, but Caddie keeps me calm and keeps me safe” says Joel, who was diagnosed with autism aged 7. Life before autism assistance dog Caddie arrived was very different to how it is now for Joel and his family. Getting Joel out of the house had become next to impossible and increasingly dangerous. He refused to hold Mum Janet’s hand and would ‘bolt’ – run off – and hide. One day he skipped blindly out into the road and was almost run down by a car. This year Joel has happily gone into a café and even ordered a drink for the first time. Another recent breakthrough was at the dentist. With Caddie’s reassuring presence, for the first time ever Joel opened his mouth and allowed the dentist to touch his teeth. 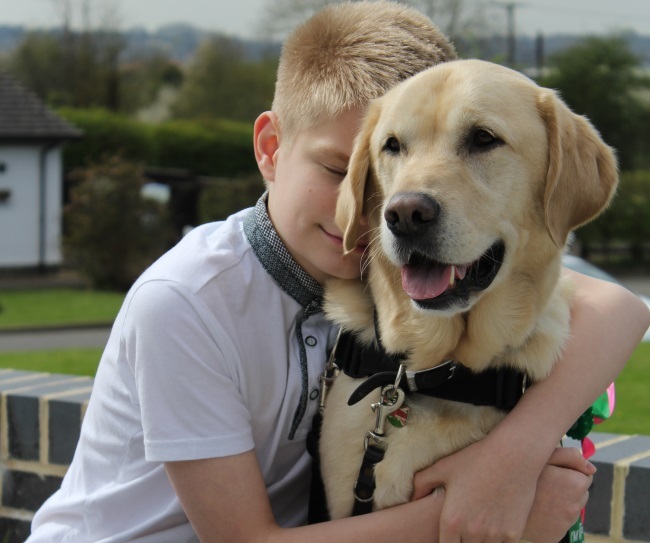 Joel and Caddie will appear on BBC Lifeline Appeal on Sunday 13th May at 2.15 pm.